So you just got the bomb hair style done to your hair. Gave your strands a hair lift, threw in some color and know your rocking it cherry red, honey blonde, ombred, the list goes on. But then you look in the mirror and notice a startling difference: your eyebrows! So technically, it’s a no-no. That’s why we opt for gentle bleaching of the eyebrows to lighten them a shade. However, if you must tint to an entirely new color stay away from boxed dyes that you use for your hair. It’s just not safe. But when should I do it, you ask? Before you throw in hair color, compare it to your natural brows. Know the contrast to see whether or not you’ll need to lighten it or not. 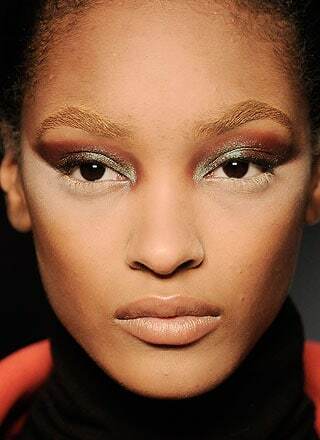 Often reds can mesh with dark brown brows and blondes, depending on your skin color, works with brown brows as well. If your coloring your hair hot pink–please don’t color your brows pink too. It’s just not a good idea. You can also test out a color with tinted eyebrow powder, brow pencil, brow gel or mascara. You may need it to keep the fill of your brows looking right. If your going to color, we strongly suggest simply lightning your brows. Most women use hues in their hair that are naturally flattering: such as oranges, yellows, browns, etc. Often, all you need is a lightening and the color of your brows will range from brown to a bright orange depending on the amount of time you use with the bleaching cream. Use an at-home bleaching kit if you still want to dye your brows. Using facial bleachers to achieve lighter brows will usually produce good results. We love Gigi Gentle Bleaching Cream, which you can purchase from your local Sally’s Beauty Supply for about five bucks. It’s not harsh at all and always gets the color right. Just be aware of those stray dark hairs that will grow in after a couple of weeks.